Olmert pleads with judges to cancel 8-month sentence, asserting the ordeal has felt like 'tennis balls' being fired at him for years. Israel's Supreme Court heard on Tuesday the appeal of disgraced former prime minister Ehud Olmert, who asked that an eight-month corruption prison sentence be cancelled, or at least served concurrently. Olmert is already facing 18 months in prison for a separate conviction on bribery, which he will begin on February 15. 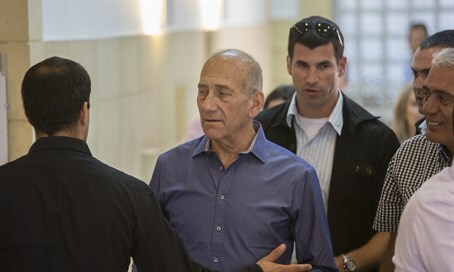 Tuesday's hearing was over Olmert's May 2015 conviction at the Jerusalem District Court of fraud and corruption for receiving envelopes of cash from a US businessman while trade and industry minister in the early 2000s. The appeal was over "the conviction and the punishment" as well as "the decision it will be consecutive and not concurrent," a lawyer for Olmert told the panel of five justices. Justice Neal Hendel did not seem convinced, asserting, "A person committed two felonies. Why would he get some kind of discount." Olmert appealed to the judges to take into consideration the difficulties he had faced over the years of investigations and trials, comparing the experience to facing a tennis ball machine firing balls "at high speed in all directions and you have to react to each ball, that's how I feel." The court did not issue a decision, nor did it say when it would rule on the appeal. On Monday, 70-year-old Olmert struck a deal with the prosecution over two charges of obstructing justice, according to which Olmert will concurrently serve six months for obstructing justice with his 18-month sentence for corruption in return to confessing to the felonies. Olmert had been sentenced in May 2014 to six years in prison on two separate charges of taking bribes in the early 2000s in connection with the construction of Jerusalem's massive Holyland residential complex. But in December the Supreme Court reduced his sentence to 18 months in prison and acquitted him of one of the charges. His prison term will be the first time a former Israeli prime minister goes to jail.